Roof Assured installer C&G Cladding replaced a badly ageing and leaking asphalt roof, with the Sarnafil single ply membrane roofing solution, on a 1950’s bungalow located in the Malvern Hills, Worcestershire. The owners, Jon and Sarah Buckland, bought the house as a refurbishment project with a new roof being a priority. The house had been re-roofed in 1991 with asphalt but years of problems had meant patch after patch to try and halt the decline. 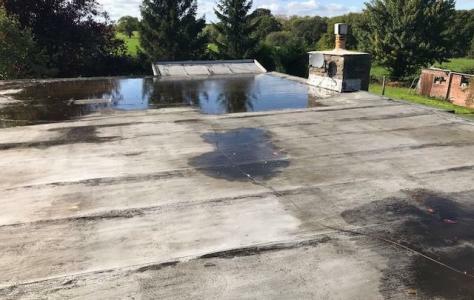 Based on this roof’s poor performance the couple decided ‘not to go down the asphalt route’ and carried out extensive research into other options including traditional slate and tiles. They had seen Sarnafil mentioned in magazines, featured in Channel 4’s Grand Designs programme, on the internet and had read a blog by Jason Orme, Editorial Director Future Pubishing, publisher of Homebuilding and Renovating magazine, on why he opted for a Sarnafil roofing solution for his personal home renovation project. The Sarnafil membrane scored highly in terms of performance and cost but it was also important to have the right look for a home located in a lovely scenic spot. They liked the colour of the lead grey membrane and this was an additional factor in choosing a Sarnafil roof. 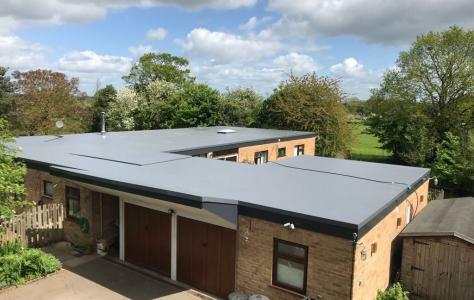 The Buckland’s then contacted C&G Cladding, a family run business based in Cheltenham and members of the Roof Assured approved installer network for over twenty years. The C&G team installed 342 sq m Sarnafil, self adhered single ply membrane on the roof. The self adhered hot air weldable roof membrane was developed by Sika Sarnafil in Switzerland and combines all the high performance, traditional features of the Sarnafil membrane with fast and easy installation thanks to a strong self adhered attachment method. Dave Anderson, Joint Managing Director, C& G Cladding said: “The self adhered membrane is easy to apply with its peel, stick and seal application. This makes it ideal for a project such as the Powick bungalow where time and cost were important. There was also a considerable amount of detailing required and the self adhered membrane gave us the extra flexibility to manage that.”. Jon and Sarah are extremely complimentary about the service they received from C&G Cladding: “They were fantastic. They had to put up with all sorts of delays including snow which meant they were here for longer than expected. We got to know them well and and we were sorry to see them leave when the project was finished. Their workmanship was excellent especially as the roof required a lot of detailing and it’s all beautifully installed”. It wasn’t only Jon and Sarah that complimented C&G on their workmanship. The Building Control Officer commented on the high quality of the installation saying that “they have done a fantastic job”. The new roof is covered by the Sika Sarnafil 15 year guarantee. Now the new roof is in place Jon and Sarah are continuing the refurbishment confident in the knowledge that that the new Sarnafil roof will protect the inside of the property as well as the outside.